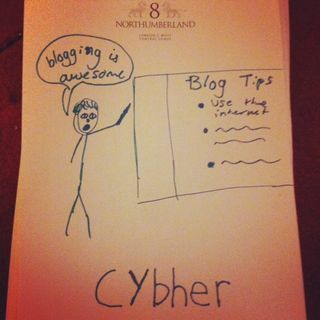 OK I know I promised you lots of hot blogging tips from Cybher, but as it turned out, it wasn’t that sort of day for me. Though there were a few choice gems – turns out I have been getting it wrong in calling my competitions, er, competitions. Legally, a competition must include some degree of skill, and whilst it might be fun to see who’s got the best reason for wanting a foot grater, you couldn’t really call that a skill. So in the interests of keeping it legal, I’ll be calling them giveaways from now on. Rather than individual tips, I found myself thinking about the bigger picture, blog-wise. Many sessions I attended talked of the importance of your blog having a clearly defined niche and a definite vision to pursue. This is bad news for me, since I have no niche. My niche is me, and the things I am interested in. I’m a Muppet Me Party blogger in that respect, a focus group of one. I was very struck this morning by a post from Mother’s Always Right asking How do you define blogging success? because I realised that in 5 years of writing this blog I had never really stopped to think about that. So I did, and this is what I came up with: For me, a successful blog is one that you want to keep on writing. And that’s it. All the other stuff is just sauce on the side. Do you like your blog, this online space that grew out of your imagination? Are you proud of it and glad you took the time to make it? Does writing it make you smile, lift you up or help you feel satisfied that you’ve expressed your point of view? Does it make a positive difference to your world, and the world in general? Ultimately blogging success, unlike other flavours of success, is a journey rather than a destination. It doesn’t matter if you’re only making small ripples, because that’s how big ripples start. Obviously if you’re blogging for business reasons or aiming to make blogging your full time job then your criteria for success will be very different, and much more clearly defined. But for the personal blogger who does it for a fun hobby, then this is what I think it boils down to. And I guess there is a business element to all of this because some people who read the blog go on to buy my book or become my coaching clients, and I would like that to go on happening. But it’s not the driving force. If it didn’t happen I would still write this blog. I was with my daughter at Cybher, and you can see her take on the day in sketches over here. When we got home I said to her: It’s not like I’m trying to push you into blogging as a thing to do. I’m trying to show you that people can create anything they want to if they pursue their ideas, and that the ideas that you have can become something amazing if you act on them. I think she got it. That, to me is a successful day, and one worth blogging about.